I was raised in Kirkland, WA, where my dad and mom both worked at Northwest University. All through grade school and up until I graduated from college, Calvary was my church home. In 1975 I helped pioneer Calvary Chapel, a church plant with a focus on university students that was sponsored by CCA. 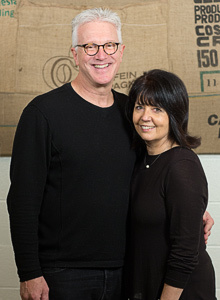 Fourteen years later, Karen and I moved our little family to Hamburg, Germany, where we worked in student ministry and as directors of Marriage Encounter for 18 years. We also planted a church there that continues to thrive. In 2007, CCA contacted us about coming back to Seattle to pastor the church I grew up in. It felt like a God thing and since then, Karen and I have been on the great adventure of helping CCA contextualize its mission to urban Seattleites. Karen and I got married right here at CCA in 1980. We have two grown children, Kevin in L.A. and Kathryn (with her husband, John) in Brooklyn, NY. No grandkids yet, but ever hopeful. Anything to do with mountains… climbing them, camping in them, boarding down them, etc. I love salmon, lightly seasoned, right off the grill. Doesn’t get much better than that. Probably my all-time favorite remains The Mission, starring Robert De Niro and Jeremy Irons. It contains the best theatrical portrayal of repentance that I have ever seen. While we lived in Europe, our favorite getaway was Florence, Italy. We love that city. I have an abiding love for C.S. Lewis, a passion that began when I was 16. My favorite is the first book I ever read of his: The Great Divorce. It impacts me because it so captures my imagination.